Free climbing is a type of rock climbing in which the climber uses only hands, feet and other parts of the body to ascend, employing ropes and forms of climbing protection to prevent falls only. In contrast, free soloing uses no aids of any kind for protection or ascent while aid climbing employs ropes, protection, and direct aids to pull or stand upon such as jumars to make upward progress on extremely sheer vertical surfaces. Used as an umbrella term, “free climbing” spans four subsets of climbing styles: traditional, sport, free soloing and bouldering. 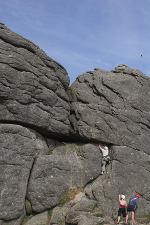 The method involves a “leader” climbing a route from the ground up. To protect him/herself, the climber trails a rope which is managed by a belayer who remains on the ground or at an established anchor. As the leader climbs, he/she can either clip the trailed rope through pieces of traditional gear (cams, stoppers), this piece of protection holds. The belayer feeds rope to the lead climber through a belay device. The leader climbs, occasionally placing protection or clipping preplaced bolted hangers, until the top is reached. The belayer is ready to “lock off” the rope in case the leader falls. Both climber and belayer attach the rope to their climbing harness. The rope is tied into the climber’s harness with a figure-of-eight loop or double bowline knot. The leader either places his own protection or clips into permanent protection already attached to the rock. In traditional climbing, the protection generally is removable. However, many significant first ascents in the U.S. done with a combination of crack gear and bolts placed on lead were termed “traditional” at the time (see below discussion). Usually nuts or spring-loaded camming devices (often referred to as “cams” or “friends”) are set in cracks in the rock (although pitons are sometimes used). In sport climbing the protection is metal loops called hangers. Hangers are secured to the rock with either expanding masonry bolts taken from the construction industry, or by placing glue-in bolt systems. In ice climbing the protection is made-up of ice screws or similar devices hammered or screwed into the ice by the leader, and removed by the second climber. 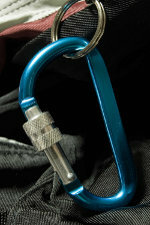 The lead climber typically connects the rope to the protection with carabiners or quickdraws. If the lead climber falls, they will fall twice the length of the rope from the last protection point, plus rope stretch (typically 5% to 8% of the rope out), plus slack. If any of the gear breaks or pulls out of the rock or if the belayer fails to lock off the belay device immediately, the fall will be significantly longer. Thus if a climber is 2 meters above the last protection they will fall 2 meters to the protection, 2 meters below the protection, plus slack and rope stretch, for a total fall of over 4 meters. If the leader falls, the belayer must arrest the rope to stop the fall. To achieve this the rope is run through a belay device attached to the belayer’s harness. The belay device runs the rope through a series of sharp curves that, when operated properly, greatly increases friction and stops the rope from running. Some of the more popular types of belay devices are the ATC Belay Device, the Figure 8 and various auto-locking belay devices such as the Petzl Gri-Gri. If the route being climbed is a multi-pitch route the leader sets up a secure anchor system at the top of the pitch, also called a belay, from where s/he can belay as his/her partner climbs. As the second climber climbs, he/she removes the gear from the rock in case of traditional climbing or removes the quickdraws from the bolts in the case of sport climbing. Both climbers are now at the top of the pitch with all their equipment. 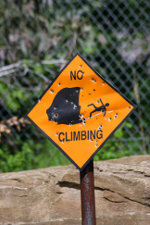 Note that the second climber is protected from above while climbing, but the lead climber is not, so being the lead climber is more challenging and dangerous. 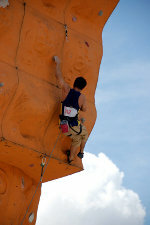 After completing the climb, and with both climbers at the top of the pitch, both climbers must rappel or descend the climb in order to return to their starting point. 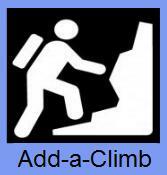 All climbs do not necessarily require the lead climber to belay the second climber from the top. The belayer could lower the lead climber down after he/she has completed a single pitch route. 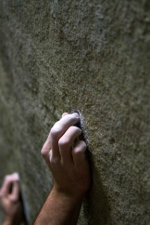 There are no rules per se to free climbing, beyond showing respect for the rock and for other climbers. Over the years, as climbing has become more popular and climbers more skilled, an entire generation of aficionados has been spawned from and with the ethics of climbing gyms and sport climbing. These climbers now share the rocks in some places with traditionally-trained adherents. In the newer generation as in previous ones, certain new conventions have emerged as the state of the art changes. Conventions aren’t universal: in fact, many older and/or more traditionally oriented climbers may ignore or actively disdain certain newer conventions, and the reverse is true as well: The more traditional values may be regarded as irrelevant, antique or “un-fun” by those who have different experience, goals and cultural identity. Climbing a given route on the first try without any advance firsthand knowledge of it (so-called on-sighting). While clear in its contrast to aid climbing, the term free climbing is nonetheless prone to misunderstanding and misuse. 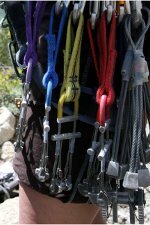 Conflating soloing a free climb with free soloing, “soloing” alone meaning merely to climb with no partner, which depending on the difficulty of the route can be done safely using any of a number of self-belaying systems.